As she campaigns for her third term for the 32nd District Washington state Senate, Chase faces Shoreline Deputy Mayor Jesse Salomon. The race has split the Democratic Party. State Sen. Maralyn Chase of Edmonds has always cut her own path as a Democrat. She’s made a sometimes-solitary push for an income tax, opposed Sound Transit expansion championed by her colleagues, and crossed the aisle to support controversial former GOP state Sen. Pam Roach. This year, Chase’s outspoken streak could foil her re-election in the 32nd Legislative District. Campaigning for her third Senate term, Chase faces a fellow Democrat in a race focused on both style and policy. 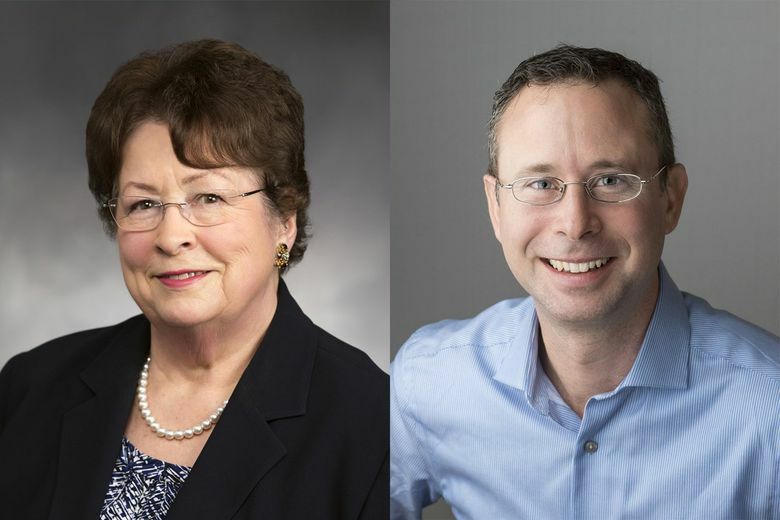 Chase’s opponent, Shoreline Deputy Mayor Jesse Salomon, narrowly beat her in the August primary, and Salomon has been endorsed by both of the district’s Democratic representatives as well as King County Executive Dow Constantine and the mayors of Shoreline, Edmonds, Lynnwood and Woodway. Several of those officials say Chase has insulted them, doesn’t listen to their concerns, or opposes policies preferred by other Democrats. But Chase has powerful supporters of her own, including state Attorney General Bob Ferguson, the Washington State Labor Council, the Democratic organizations of King and Snohomish counties and Planned Parenthood Votes. Chase said she is puzzled by the criticisms, or described them as misunderstandings or disagreements over policy. Salomon wouldn’t be much different than her in the Legislature, she argued, and his surprise showing has invigorated her campaign. The 32nd District includes part of Northwest Seattle, the cities of Lynnwood, Mountlake Terrace, Shoreline and Woodway and some of Edmonds. Chase, 76, won her first Senate election in 2010, and before that, served in the House since 2002. Salomon, 42, bested her in the August primary by 168 votes. He has also outraised Chase, in part by making a $30,000 donation to his own campaign, according to state records. Salomon is a former public defender for King County and before that, a child-welfare prosecutor for the Lummi Nation in Whatcom County. He won election to the Shoreline City Council in 2011 and has campaigned to boost investments for early-childhood education and revamp the tax system to depend less on property taxes. Both candidates support rolling back tax exemptions and making other changes to raise revenue and reduce property taxes. Many Puget Sound-area lawmakers detested the Legislature’s 2017 state property-tax increase to fund a court-ordered K-12 school-funding plan; Chase voted against it. In an interview, Salomon referred to the criticisms of those who feel put off by Chase. Ryu and the district’s other House representative, Ruth Kagi, D-Seattle, who isn’t running for re-election this year, said they stopped holding town halls with Chase in recent years, because the senator would dominate the sessions. The representatives also said they stopped attending meetings for the 32nd District Democrats, which is led by Chase’s daughter, Carin Chase. Ryu said Sen. Chase didn’t do enough to condemn what Ryu described as a racially insensitive newsletter produced a couple years ago by a member of the 32nd District Democrats. Chase said the group brought in a mediator after that newsletter to resolve the conflict. Ryu described Chase’s behavior as similar to that of former Sen. Pam Roach of Auburn, a Republican who is now a Pierce County Council member. Roach made headlines last week for dropping the F-bomb on her son, a fellow council member, during a budget retreat. “Maralyn has been an absolute champion in the Legislature on working-family issues, whether it’s voting for progressive revenue, supporting health and safety measures and collective bargaining,” Johnson said. Chase touts her work on a task force created by one of her bills this year to help workers obtain new job skills in the face of globalization and new technology. Shoreline City Councilman Chris Roberts, who has endorsed Chase, described the Senate contest as a natural product of Washington’s top-two primary system, where the two candidates with the most votes advance to the general election regardless of party. “I think she has a very outstanding record of supporting progressive values,” said Roberts, who ran unsuccessfully in the August primary against Lauren Davis, the Democrat seeking to replace Kagi. The district rivalries extended to that race, too: Chase backed Roberts, while Kagi and Ryu supported Davis. Constantine, the King County executive, said he’s backing Salomon in part for his support of Sound Transit 3, the $54 billion plan to expand light-rail and bus service across the region. The plan includes two new light-rail stations in Shoreline. “By contrast, Maralyn opposed, and campaigned against, Sound Transit 3 and Sound Transit 2,” Constantine said. Lynnwood Mayor Nicola Smith said she’s had trouble getting meetings with Chase in Olympia. When they do meet, Smith said she gets “lectured” about Chase’s agenda. Chase dismissed the criticism. “The mayors don’t like anyone interfering with their ability to raise taxes,” she said. Correction: An earlier version of this story misstated the person that Rep. Cindy Ryu contended did not do enough to condemn what she described as a racially-insensitive newsletter. Ryu was referring to Sen. Chase, not Carin Chase. Staff researcher Miyoko Wolf contributed to this report.